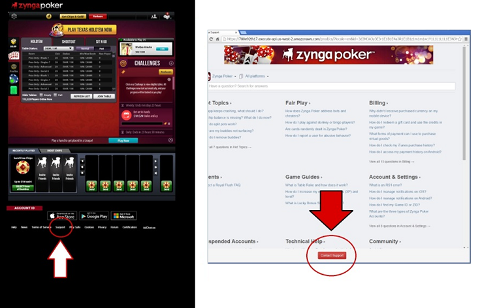 A player’s account must be logged in the device or computer in order to contact the Zynga Poker Customer Support. No need to go to the support link. Now, it’s just a few clicks away! Scroll down to view the helpful links below, then click on Support. You will be redirected to our Customer Support site. An option to contact us will appear below; click on it. Tap on the Game Settings then choose Customer Support and Legal. Tap on Customer Service to proceed. Make sure to open it with your mobile browser and NOT Zynga Poker or you will be put in an endless loop. Tap on Customer Service to proceed.